New features in the updated Emory Mobile app include a module so students and faculty can log into OPUS; a new HR module will soon let staff and faculty view paycheck information. Emory University's mobile app, Emory Mobile, has been updated for iPhone and Android devices to offer an improved interface and new features for visitors and the Emory community. The new version became available Aug. 11, in time for the fall semester. 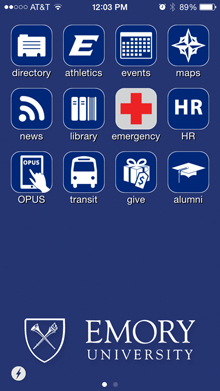 An OPUS module has been added to the app by Enrollment Services so students and faculty can use Emory Mobile to log in to the Emory OPUS system. Students can view their class schedule, grades, exam schedule, holds and to-do lists, as well as browse course descriptions and class meeting information and update personal information. Faculty can view information on advisees and students, view class rosters and send email to students in their class. A new HR module, which Human Resources expects to be operational later in the fall, will allow staff and faculty to log into the Emory Human Resources system to view paycheck information. The updated maps and transportation modules allow visitors to navigate campus, take tours, catch shuttles and find dining locations. Emory Mobile was completely rebuilt on Blackboard Mobile's new Mosaic for Mobile platform, with updated graphics and an improved capability to keep the app's features updated without requiring version updates to be re-installed. "This new version of Emory Mobile is a major upgrade of both form and function," says Jan Gleason, assistant vice president of University Marketing. "But just like every version since we launched it in 2010, it is the product of a terrifically effective joint-venture between Emory Library and Information Technology Services (LITS) and University Communications and Marketing to move key information sources to mobile devices." The percentage of visitors to www.emory.edu using mobile devices increased from 1.6 percent in 2010 to 9.9 percent in 2012 to its current level of nearly 17 percent of all sessions. "We're continuing to add features to streamline the use of Emory's academic and business transactions on Emory Mobile," says Robin Horton, coordinator of labs for LITS. "There have been about 35,000 downloads of the app in the past four years which is proof that our community has embraced it. In FY13, there were nearly 325,000 runs of the app." A first-ever version of Emory Mobile for iPad is also planned for release in upcoming weeks. For more information on Emory Mobile and links to app downloads, visit m.emory.edu. Blackboard Mobile is a product of Blackboard, Inc. Android is a trademark of Google Inc. iOS is a registered trademark of Apple Inc.